Crewe Alexandra top scorer Ryan Colclough says he is getting back to his best form, but knows he still has plenty of room for improvement. The 20-year-old winger has scored six goals so far this season as the Alex try to get out of the League One relegation zone. "I feel like I'm getting back to what I was happy with but there's a lot more to come," Colclough said. "My fitness is getting better and I'm improving all areas of my game." Colclough has been an ever-present for the Alex so far this season, after missing 16 months between November 2013 and March 2015 with a succession of injuries, coupled with off-field problems. But now he is back playing regularly, Colclough is looking forward to taking his game to a new level. "I can make better decisions at times and take chances better, but I'm starting to pick up form and I'm feeling more dangerous," he told BBC Radio Stoke. 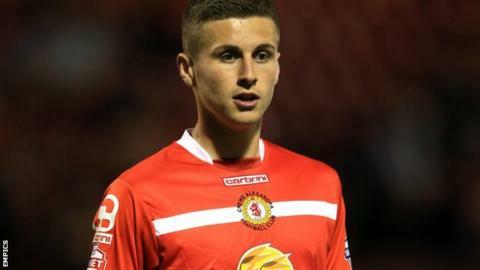 Stoke-born Colclough made his debut for Crewe as a 17-year-old in September 2012 and looked set to leave Gresty Road at the end of last season after turning down a new contract. After appearing for Wolves in a pre-season game last summer, he signed a fresh deal with the Alex in August 2015. "Anyone who gets injured and is out for a while gets forgotten about, but I've always believed in myself and that I could do an important role for the team if I got fit. "I feel looked after here and hopefully I can keep repaying the club." Crewe are next back in action on 12 December and, although still one point adrift of safety in the relegation zone, Colclough is confident they can improve their situation further after back-to-back wins. "It's so tight at the bottom, we could win our next couple of games and be right out of it near the middle of the table. "I'm sure we're capable of doing that - we've just got to keep working hard and come up with the goods on game day."